I found these two Ginger Jars last week in an exhibition of art in Paris and I would like to know if you could help me with some information on them? 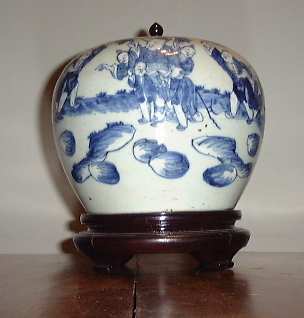 This "Ginger Jar" is from the latter half of the 19th century. They are most often attributed to the Tongzhi (1862 - 1874) period of the Qing dynasty. 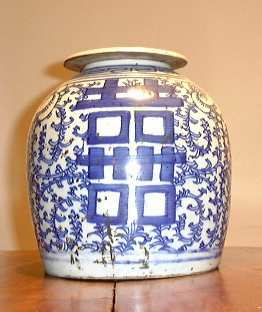 The big symbol that embellishes both the body of the Jar and its interesting and unusual lid, is an ornamental design called a "double happiness mark" referring to "wedded bliss". In Chinese it is referred to as shuangxi meaning "double xi (joy)". The shuangxi symbol is typically found embellishing any and all items used in relation to weddings. It appears in porcelain decorations from at least early 19th century but get a great upswing in popularity at the time of Emperor Tongzhi's wedding that was scheduled to take place in the eleventh year of the Tongzhi period, or 1872. This wedding was an occasion of unique historical significance at the time since this was the first Imperial wedding since the period of Kangxi, over 200 years before. The special wedding porcelain that was ordered for this event included at least one order of 7,294 porcelain pieces sent to Beijing in 120 barrels of which a large number of pieces which decoration included a double xi mark. This symbol also occurred on innumerable wedding implements in textiles, lacquer and in all kinds of materials and purposes including wall panels in the Imperial wedding chamber. It is likely that the popularity of this symbol in wedding decorations stems from this important and much celebrated event. In Chinese art "vines" symbolizes "forever" and through the connection to fruits like melons and pumpkins growing on vines, also the idea of many children. These Jars are not that unusual and are normally supposed to have been made to contain preserved Ginger. It is also told that these jars were used as a wedding gift where it was generally understood that the gift only consisted of the content, so, when the fruits or gingers were consumed, the jars were to be brought back. Another tradition tells that Chinese generosity is very much based on reciprocity thus if the jar was given full, it would need to be given back filled with at least something else. This from a western perspective would of course nullify the gift, but still works as a symbolic act of closeness and relation. Your second Jar I think we should just refer to as a "Lidded Jar", since there is no tradition connected to it ever to have been made specifically to contain Ginger, as is the case with the one above. Regarding the age, this kind of Jars is actually still made and there is not much I can see on the picture that would distinguish this Jar from any other made during the last century. I would therefore recommend that you consider it more or less "modern". Considering the gilded lid, which I assume might be made of wood, it might have some age though, so as for a more specific date I would suggest mid 20th century.